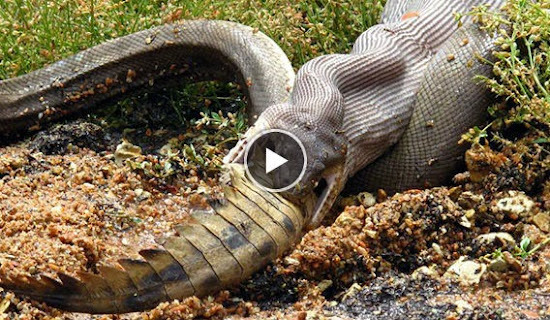 The snake was captured on camera eating a crocodile in Queensland, Australia. The photos shows the snake wrestling the crocodile before strangling it and eating it. The snake was about 10-feet long. Experts think it probably is a python. It could be seen coiling itself around the crocodile as the pair both fought in the water. The snake won. The snake then dragged the dead croc onto dry land where it ate the reptile whole. The snake eating a crocodile drama was documented in pictures by Tiffany Corlis, a local author. The photos went viral in the Australian media. "It was amazing," Corlis told the BBC. "We saw the snake fighting with the crocodile - it would roll the crocodile around to get a better grip, and coil its body around the crocodile's legs to hold it tight." "The fight began in the water - the crocodile was trying to hold its head out of the water at one time, and the snake was constricting it." "After the crocodile had died, the snake uncoiled itself, came around to the front, and started to eat the crocodile, face-first," she added. The author said that it took the snake about 15 minutes to eat the croc. She said the snake appeared “very full.” She added, "I don't know where it went after that - we all left, thinking we didn't want to stick around!" The snake eating croc was also witnessed by Alyce Rosenthal. She told the media that the two fought for about five hours before the snake finally strangled the crocodile. Experts say that pythons are able to kill their prey by tighten its coils around the animal and not allowing it to breath. Many snakes also have flexible jaws allowing them to swallow large animals whole. Undoubtedly, this was not the first time a snake ate a crocodile, but it may have been the first time it was documented with photos.